When I was in high school, I came up with a group of characters who were very loosely based on me and my friends. I thought that I would eventually write a musical about them, because I was going through my 'everything should be a musical' phase. Over time, those characters slowly became more developed in my own imagination. 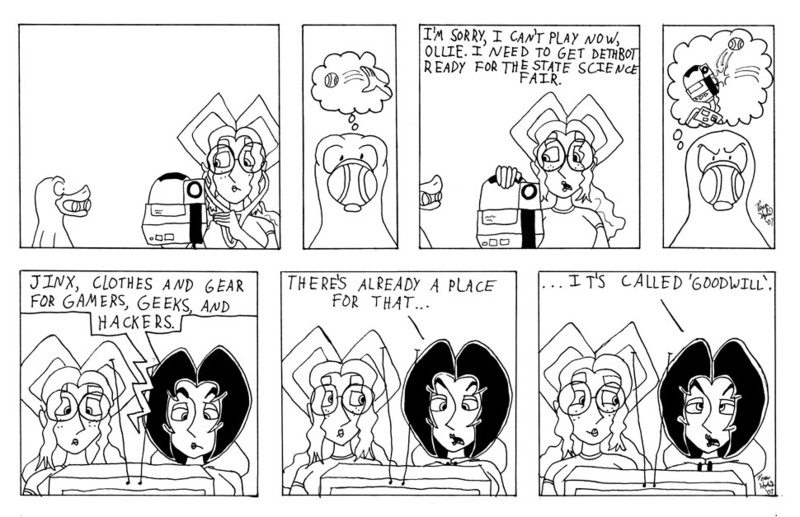 Then in college (during my cartoonist phase), I decided the best way to develop them further was to make a comic strip about them. I placed them in seventh grade, and drew inspiration from my experiences student teaching and subbing in middle schools (I found seventh grade to be, on average, the most difficult grade level to sub for--seventh graders are insane). The title Seventh Grade Stretch is a pun on the baseball term 'seventh inning stretch'. 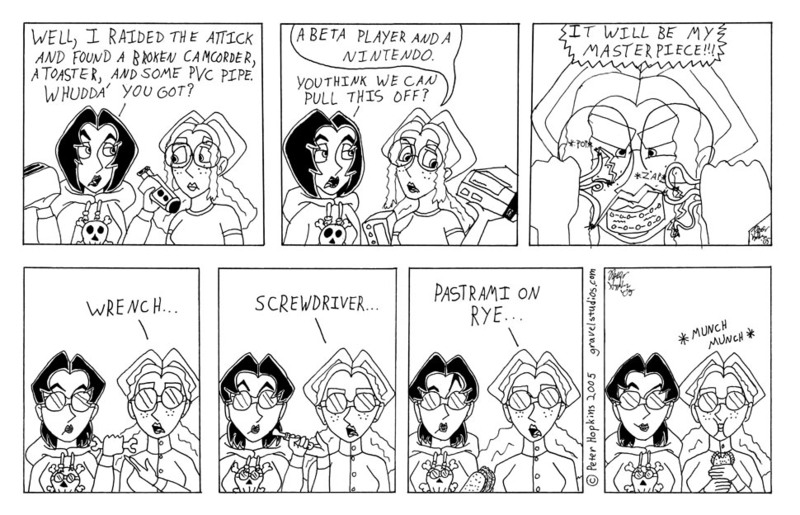 I did this web comic for several years, and at one point tried without success to get it syndicated. 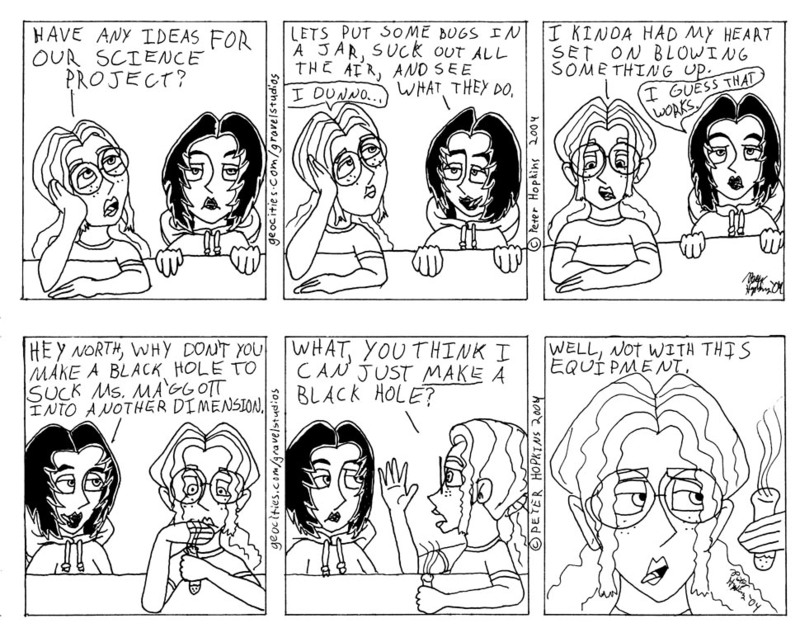 As of the writing of this blog entry, I haven't drawn a Seventh Grade Stretch strip in several years. I didn't mean to quit. I enjoyed doing it, but it was a lot of work for very little payoff, and I had other more pressing things to do. 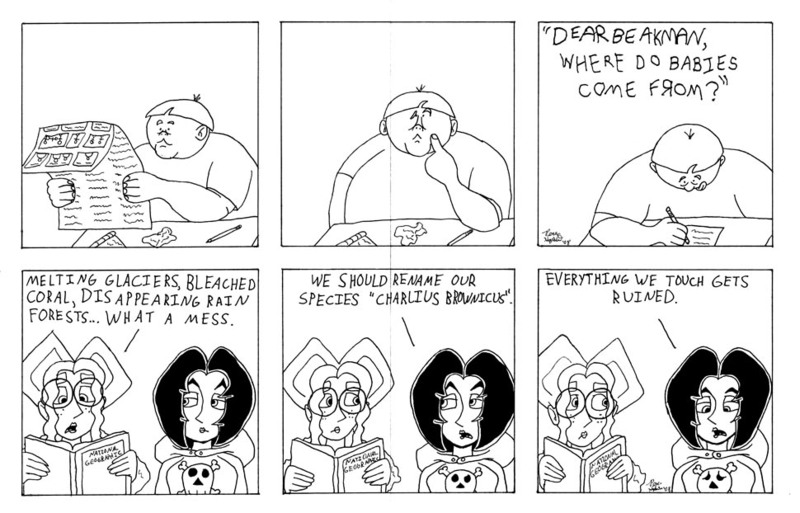 Every so often I still get ideas for strips, and I still want to write that musical. Part of me wants to announce a reboot, but I'm hesitant to make those kinds of statements in case I can't follow through. These characters are still alive in my mind (including several that I didn't get a chance to introduce). I'd like to finish the stories that I started with them, like what happens with Dethbot at the science fair, or Pone's experiences in band. But I don't want to commit myself. For now, this blog entry will be an archive of a little body of work which I may or may not continue at a later time. That's good enough for me. Pone Chicken is based on me in middle school. 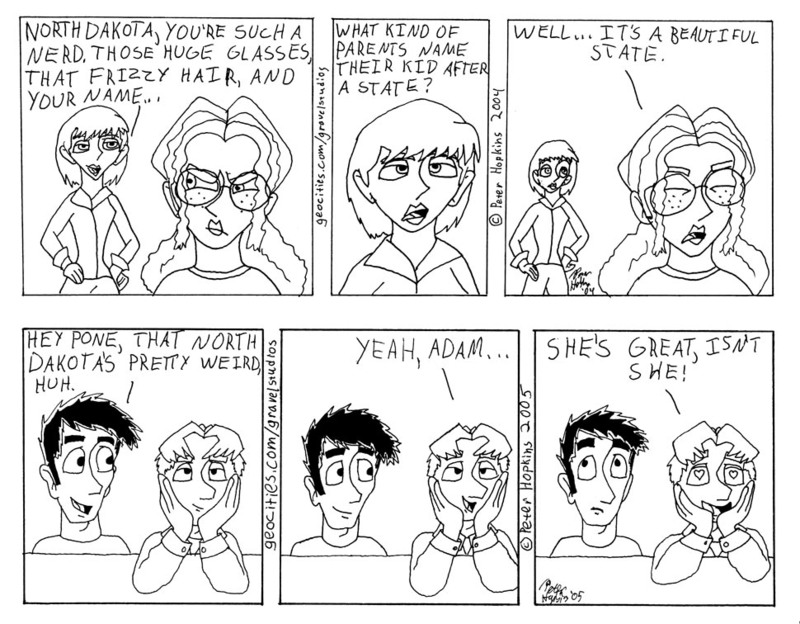 North Dakota is based on the first girl I ever fell in love with. The original caption for the last frame was "Mega Do-nut: It's not your mother's tampon". 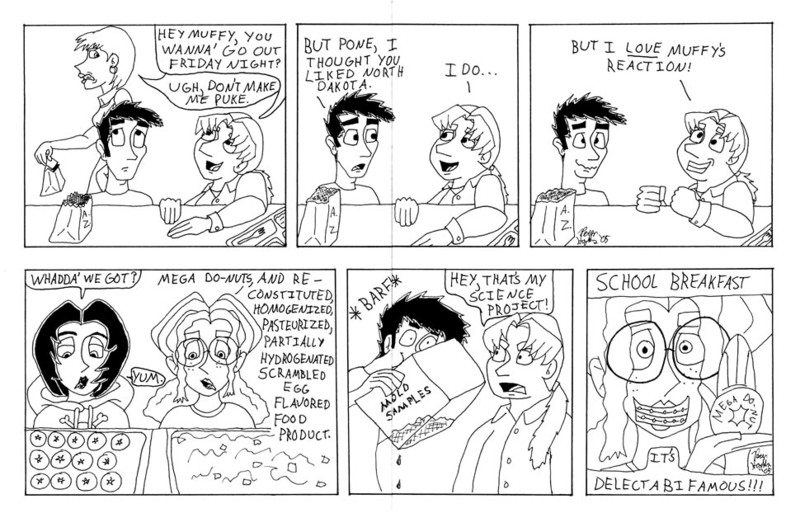 It was based on a commercial my brothers and I used to make fun of when we were kids. 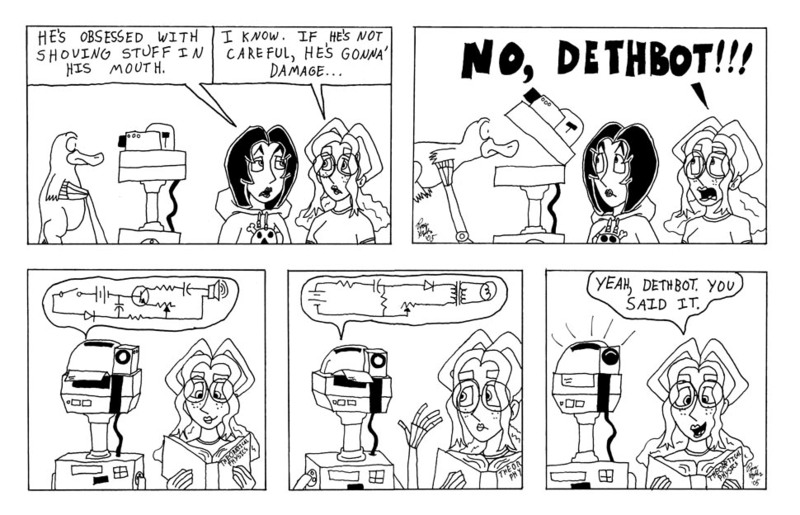 I decided it was too crude for the strip. In retrospect, I wish I'd left it in. Ms. Ma'ggott is based (VERY loosely) on the teacher I student taught under (although she actually loved her students and was a very good teacher). I think Ms. Ma'ggott was really a way for me to express some of my deepest frustrations about the more difficult kids I had to deal with. Mrs. Mills is also based on a real teacher I knew at the school where I student taught. I wanted her to be more positive, in order to counterbalance Ms. Ma'ggott's negativity. This next strip's last frame is a reference to the website Fat Chicks in Party Hats. In case you can't read that text, the name of the restaurant is The Sweet and Sour Dragon. Ollie is North's pet platypus. I came up with the idea long before Phineas and Ferb was on TV. It always frustrates me when I come up with an idea I really like, only to discover a famous franchise doing it too. I'm always afraid people with think I stole it when I didn't. 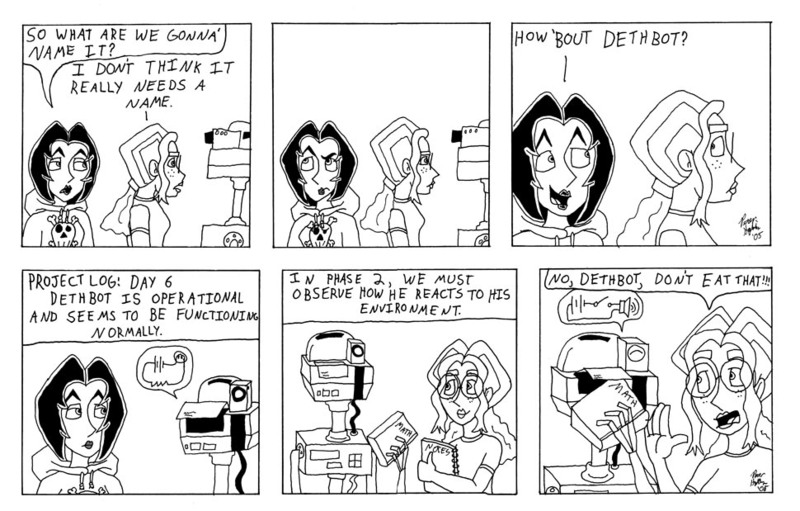 Dethbot speaks in electrical circuit schematics. I don't really know what sounds that would make. Also, his text circuits aren't real, I just made them up to look interesting. If they make functioning electronics, it was unintentional. Pone is playing the piano in this strip, accompanying the ladies' trio at church. 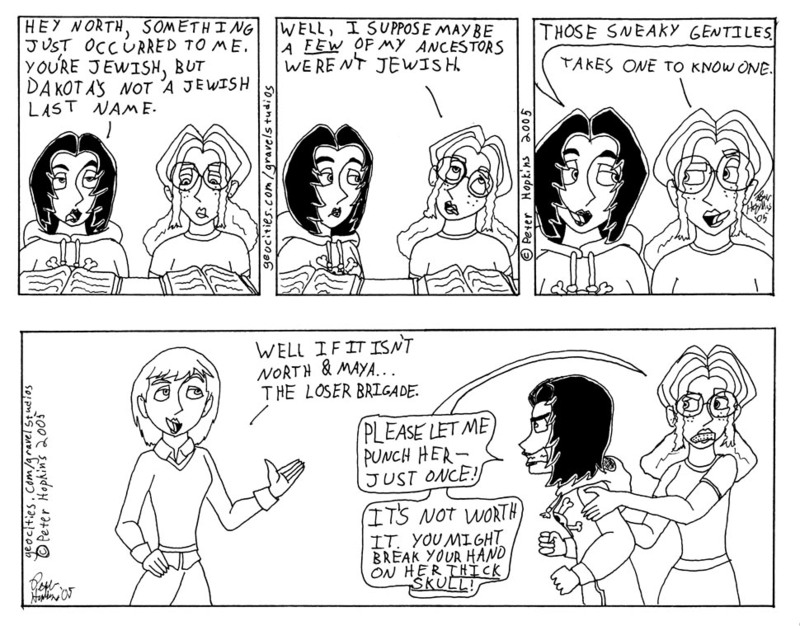 Those three women are very real, and all of my friends who know them recognize them instantly in this drawing. There are several shout-outs in this strip. Metroid is my favorite video game, Mary Poppins is my favorite movie, and at the time I was a huge Kim Possible fan (on Maya's hoodie). I did these next two after a couple of especially difficult days of subbing. 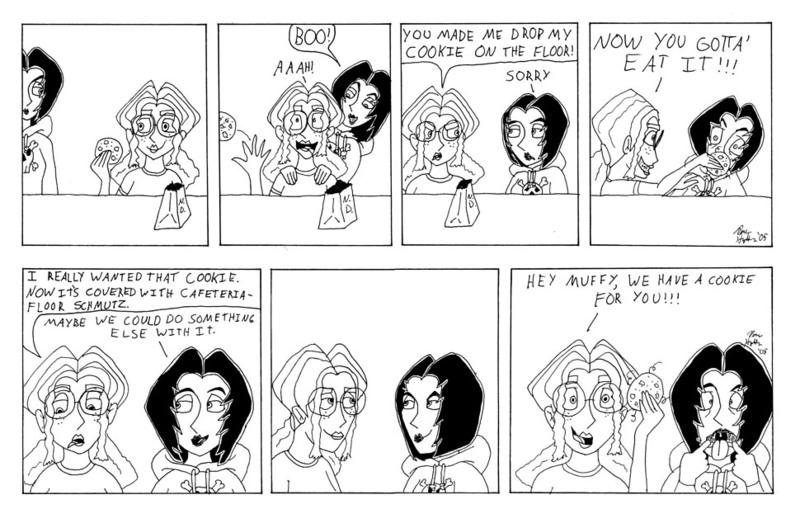 This strip was an art trade with a old friend on deviantart. We agreed to draw each other, and this was how I did it. She was a huge Indiana Jones fan. You'll only get this joke if you're a fan of Star Trek. 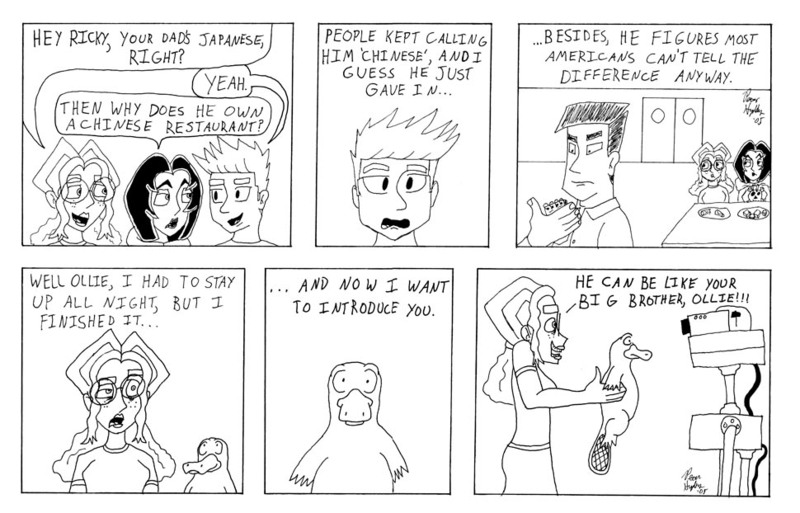 I had the idea that I could save some time by recycling this strip and just changing the text. It was going to be a running gag. Warren is based on a student I had while subbing. Mr. Hawk is me as a substitute. 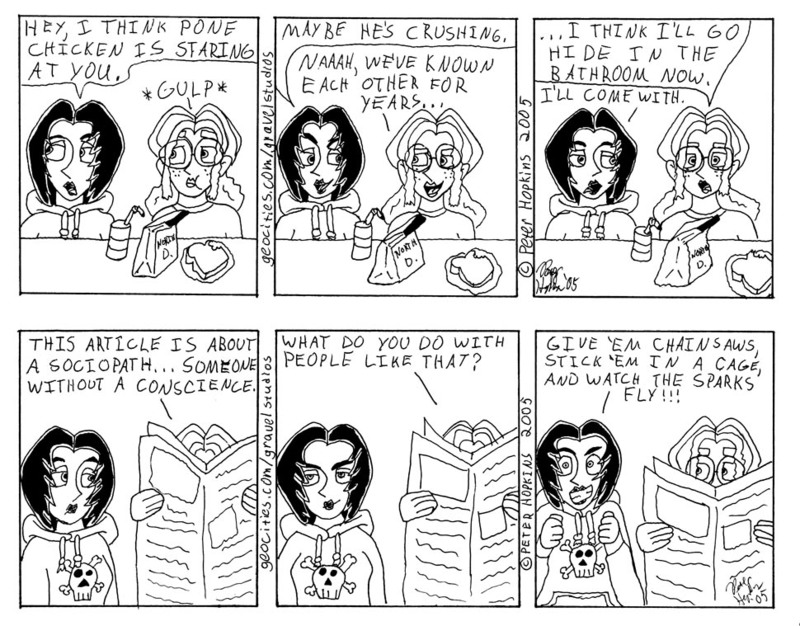 I recognize the strangeness of having two versions of me at different ages (Mr. Hawk and Pone) in the same comic strip. 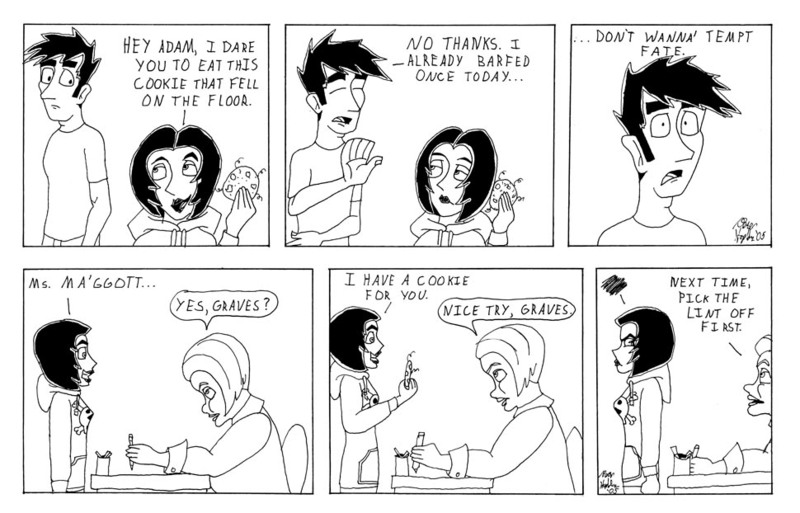 Anyway, this strip is also autobiographical. Arnold Jacobs played tuba in the Chicago Symphony for years. His ideas revolutionized brass playing. 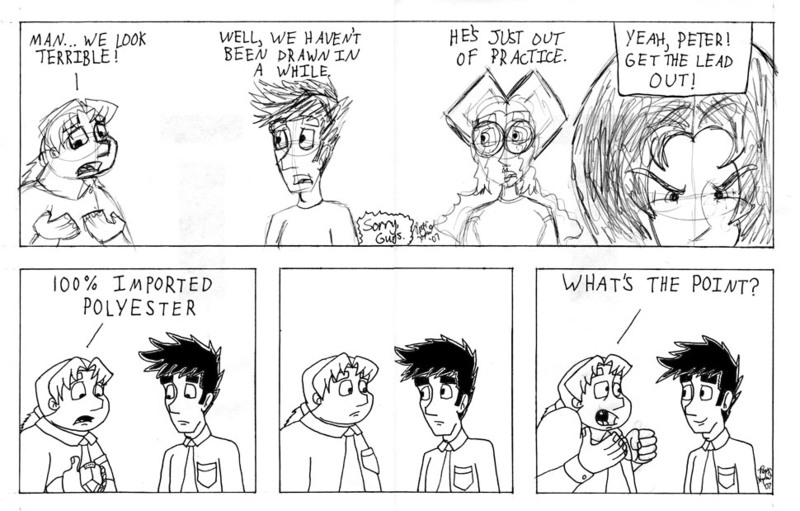 At this point, I went on an unintended hiatus from cartooning for several months. Honestly, I was starting to lose interest. 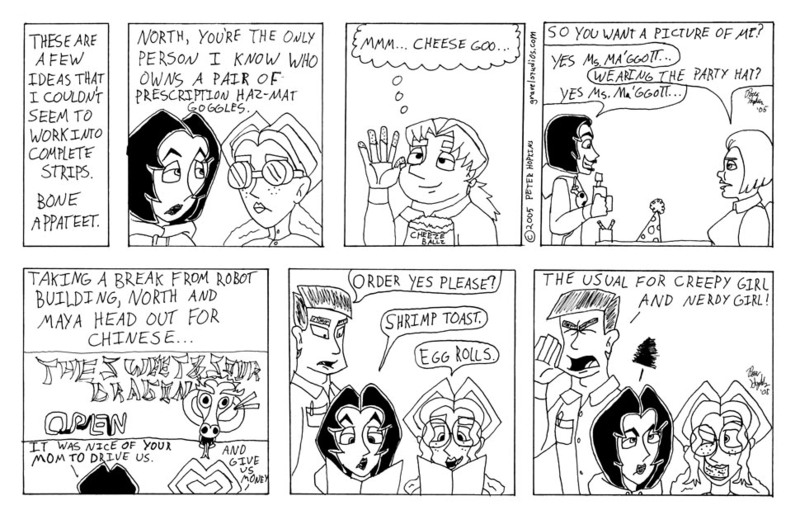 This strip is based on a commercial that was on TV a lot at the time. 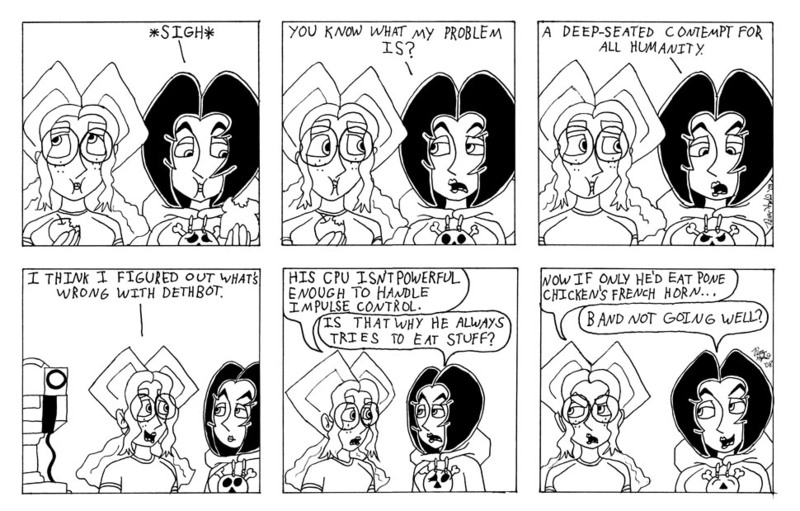 I lost this strip, so I had to recreate the text from memory. I'm not sure if it's exactly right, but it's close. 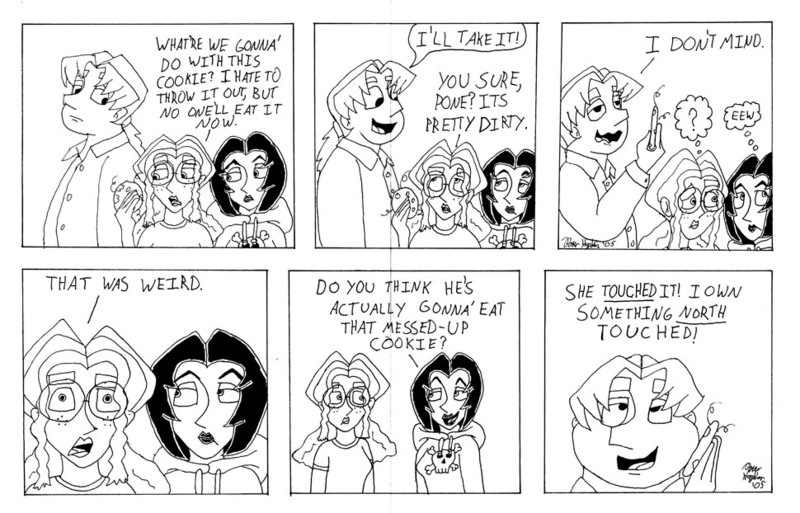 Anyway, You'd only get the joke if you were a fan of Fullmetal Alchemist.